Wow. That was the first thing I (Breanna) said when I saw Marah on the day of her engagement session. That red dress and red lipstick against her dark hair and eyes? Just wow. She looked breath taking and definitely ready to strike a pose and make some beautiful engagement photos happen! Sorry Shawn, I don’t mean to leave you out but I’m guessing you don’t want me gushing about how pretty you are! 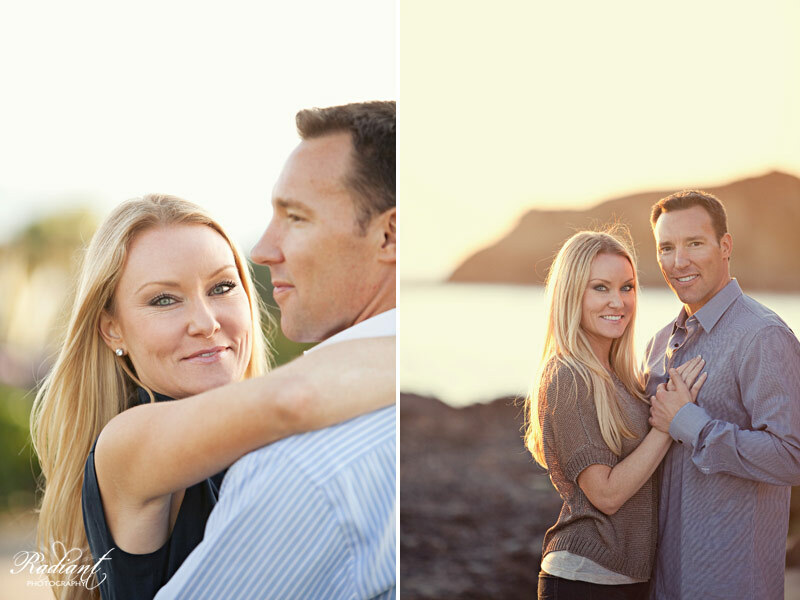 We had so much fun walking around Crystal Cove in Laguna Beach with Marah and Shawn! We also had some special guests with us, Shannon Avery’s team from Avery J. Productions was there to get some beautiful video of them having fun together to complete the love story film. I’ve always known that Crystal Cove is beautiful, but Shannon led us to some spots we’d never been to and we were amazed at what we were able to get there! We had so many adorable little areas to work with, not to mention massive amount of stunningness to set off the cuteness, and we felt like there wasn’t enough time in the world to shoot everything we’d want to there! I had to grab Scottie by the shirt collar and drag him away through the sand to get him to stop shooting when the session was over. But of course he just held his camera up to his face while being drug so he could shoot from a low angle (you know that’s a lie because he’s a giant and I’m not). Scottie’s famous for saying he’s done and then as we’re walking away yelling, “wait, just this one more shot!”. But here it was more like, “wait, just 10 more shots!”. I can’t say I blame him though, with such wonderful people as Marah and Shawn to work with, how could we want to do anything other than continue to hang out with them! So all in all we had a fantastic time laughing together and had a great creative collaboration with Shannon and her team, while hanging out in a gorgeous location and getting amazing photos… I’d call this session a success! Click to see the rest of the photos from Marah and Shawn’s Beach Engagement session! The first words that come to mind when I think of Amanda and Javier are playful and fun. They both love to laugh and have fun together. (Along with their dog Isis of course!). …which is why we wanted to help them show off their championship rings! Amanda is a softball queen and Javier is the wrestling king… such a great couple right!?! At least Amanda always knows that if Javier thinks he can beat her with his sick wrestling holds, she can always bust out the bat and put him in his place! Thanks so much you two for letting us in on all the fun you have and allowing us to capture it so everyone else can be a part of it as well! I can’t wait to see what kind of fun stuff you have planned for your wedding! Click to see the rest of Javier and Amanda’s photos. At the mention of coming to Los Angeles for their engagement session, I saw Susanne and Greg’s eyes light up. At the mention of the fact that they’d come over to the Westside of LA where we’re at, our eyes lit up. We finally get to do a photoshoot in our neck of the woods… or side of the beach as is the case here (don’t worry Phoenix fans, we commute back and forth regularly so we’ll still be able to shoot your wedding, senior session, or whatever… we’re just working in both places now)! (Checking out the ocean view on the other side of the PCH). The original thought was that we’d wander all over west LA to get some of the art culture of Venice (where we actually live), mixed in with the carnival fun of the Santa Monica pier, and adding in a little Malibu cliff side beach magic to top it all off. However, once we sat down and really started talking about it, we realized that we could get more different looks in Santa Monica alone if we just stayed in that area, so we did. (That’s the Santa Monica Pier in the background there). …they were extra happy and cute together! We then moved onto the Santa Monica Pier… or at least we tried to, it was a raging madhouse of people down there that day! The best we could do was to get a picture above all the chaos and it turned into a shot that I absolutely love! We stayed up in the park area that overlooks the beach, and even then it was hard to keep from having too many people in the background! It was a busy weekend around there! But that wasn’t a huge problem because Susanne and Greg seriously stole the show! I’m not kidding, they are PERFECT for each other and just absolutely adorable together. Which is proof that eHarmony works people! I especially loved watching how sweet and gentle Greg was towards Susanne, he definitely treats her like a princess… which should pan out well on the wedding day since that’s exactly how every girl wants to feel on her big day (and on ANY day actually!) so Susanne will definitely get her princess fix in! (On the bridge over the Pacific Coast Highway, and under the sign for Santa Monica Blvd). We finished up the session down on the beach just in time …and I do mean JUST in time…. we were almost running in the sand to get there. Especially me because I’m a slow sand walker (seriously, everyone makes fun of me for it). But we made it (even me) in time and got some beautiful shots from it all! Seriously, aren’t they so cute together?! (I love the funny faces they’d make at each other whenever Susanne got her little itch to let her funny side show for the camera!). I can’t wait to see what they’re like on the wedding day! All we had to do was let them interact together and forget posing entirely because they did their best when they were just allowed to act as in love as they really are. Thanks guys! We can’t wait to hang out with you on your big day and see what kind of awesome style and magic you bring to it! It’s gonna be AH-MAZING!!!! Can’t wait!!!! Click to see the rest of Susanne and Greg’s West LA engagement session.